...RELATES HOW THE BICYCLE FIRST CAME TO BUFFALO, New York, how Buffalo accepted it, how it influenced Buffalo's people, and as in other areas of the country, how Buffalonians became infatuated with it and perhaps, as we still do today, over-did it "the American way." Buffalo prospered from the bicycle economically and socially. Buffalo became a prominent hotbed in bicycle manufacturing and racing. Buffalonians became racing champions and made careers with bicycles that changed their lives. The social use of the bicycle in Buffalo changed lifestyles. Some of Buffalo's pioneer cyclists were prominent businessmen; others became icons in the bicycle industry and world champion racers. 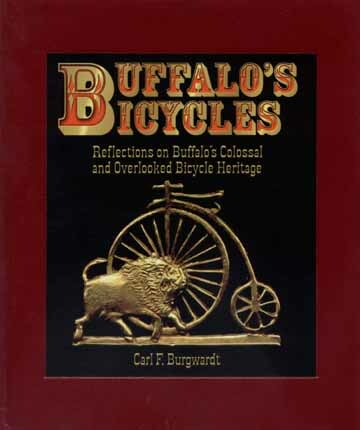 IN BUFFALO'S BICYCLES; Carl F. Burgwardt has carefully chosen, organized, and assembled significant historical facts of Buffalo's bicycle industry and bicycling records. He has added personal lore and period images, combining these elements into a book that explores and showcases the nearly forgotten but colorful times in Buffalo's proud past. Buffalo's love affair with the bicycle was stupendous! By the late 1890's it had involved a significant percentage of Buffalo's population. Its exciting effect on society and sports was no less than its impact on business and the economy. Buffalo's Bicycles will introduce you to some of the people who shaped this phenomenal heritage that left influences and impressions on Buffalo for decades thereafter. IF YOU'RE A LONGTIME BUFFALONIAN OR WESTERN NEW YORKER, this book may well awaken some memories from your past. It also has a good chance of shaking a few names out of the family tree. IF YOU'RE NOT A NATIVE WESTERN NEW YORKER you can just enjoy an introduction to Buffalo's rich bicycle heritage in text and photographs that quickly make you aware that this was truly a colorful, dramatic, and influential period in Buffalo's past. MANY NON-BICYCLE PEOPLE may find that this history has surprising asides that kindle and tickle much nostalgia. The taken-for-granted bicycle, through its popular and everyday usage, has touched nearly everyone's life at one time or another, generally in a pleasurable and memorable way.